You may have noticed from reading my blog that every so often I post photos of my milk deliveries. It’s sad, but true, that I am very proud that for the past 12 years we have had a doorstep milk delivery. When we first moved to the village we used a local delivery service. However this was passed onto Dairy Crest who now deliver our milk. 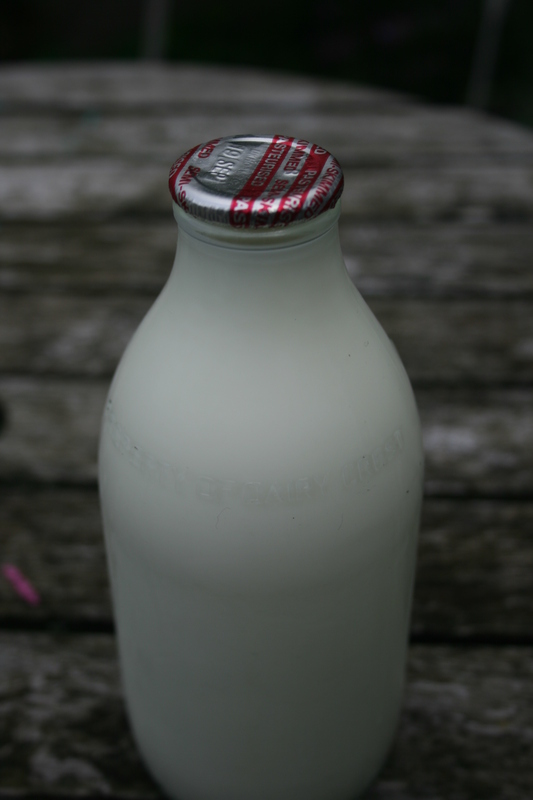 There are many reasons why we chose to have a milk delivery but as well as convenience and reliability one of the biggest factors is the returnable glass bottles. Through all the zero waste/non supermarket/plastic free challenges I have undertaken on this blog I have always been able to smugly sit back and know that my milk (and, at times, orange juice) supply has ticked all of the boxes above. (And the foil tops can be put straight into my recycling box). The company claims that, as well as being more expensive to produce, glass weighs 15 times more which makes it more expensive to transport. Dairy Crest also claims that plastic is as environmentally friendly as glass. It does take more energy to produce glass but glass milk bottles can be re-used up to 20 times whereas plastic can only be used once. Plastic recycling also uses more resources and the quality of a recycled product is reduced (this also depends on us buying/using recycled plastic products as well). I can understand that from an economic point of view Dairy Crest feels it has to swap to plastic bottle production. In 2012 only 2 million households had doorstep deliveries, compared to 40 million twenty years ago. That’s sad. I get milk delivered in glass bottles too, and like you love the fact they get reused. I know. I think I would probably carry on with the doorstep delivery because of convenience but it won’t be the same opening my door to some plastic bottles. cant we start a petition? No! We love our glass bottles and buy because we prefer that our food doesn’t come from plastic containers. Know we aren’t the only ones that feel this way either. Always been happy to pay so much more knowing it comes in glass. Maybe they should do a survey of customers to see who will be going elsewhere if they drop the glass bottles, know I’ll certainly be looking now I know this. Excellent Pam! Well done for doing this. Have signed and added my penny’s worth.